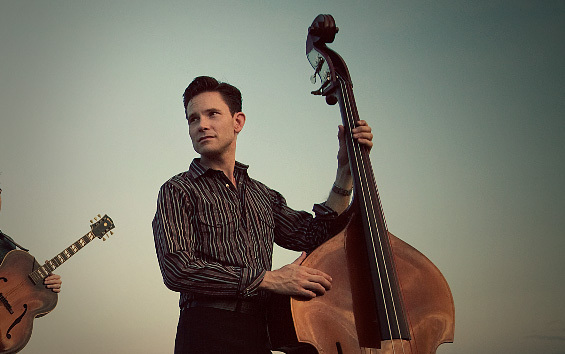 Born in 1974, upright bassist Jake Erwin hails from Tulsa, Oklahoma, location of the legendary Cain’s Ballroom, home of Bob Wills and the Texas Playboys. He took an interest in American roots music at an early age and decided to explore its variations through the sound of the double bass. He has become one of the country’s premier practitioners of percussive “slap bass”, a style begun in early New Orleans jazz that continues through country, blues and even rock ‘n roll today. Jake has been inducted into the Texas Western Swing Hall of Fame (one of the youngest members ever) and has been a featured performer (with the Hot Club of Cowtown) on A Prairie Home Companion, Mountain Stage, World Cafe Live, “Later with Jools Holland” on BBC television, the Fuji Rock Festival in Japan, the Smithsonian Institiution, Jazz at Lincoln Center, a Midsummer Night’s Swing (also at Lincoln Center), to name only a few, and has toured with Bob Dylan and Willie Nelson, the Mavericks and the Squirrel Nut Zippers. In addition to the Hot Club of Cowtwon, he has had the honor of recording and playing with some of Texas’ finest performers and songwriters, including Wayne Hancock, Ronnie Dawson, The Asylum Street Spankers, Max Stalling and Kim Lenz.